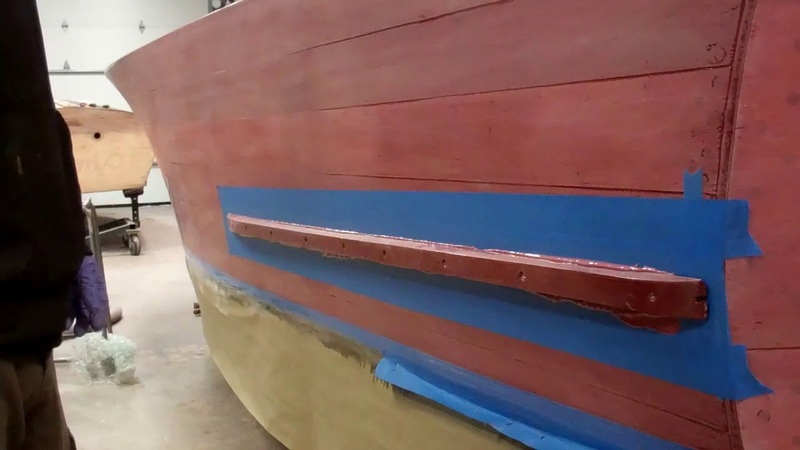 Thank you for the several requests that we record how we install the splash rails on the 1946 Chris-Craft Brightside U22. Since we must avoid screws punching through into the hull’s interior at all costs, we carefully recorded the length of each fastener as we removed them over a year ago now. That record guides RJ and John as they select and lay out the fasteners to be used in the order they will be sunk through the rails and into the hull planks, battens and frames. Note in the clip that the rails are varnished. Indeed, we varnish all freed components as we varnish the hull. Therefore, all of them have had seven coats applied at this point. The rails will be sanded flat sometime next week before coat number eight is applied.